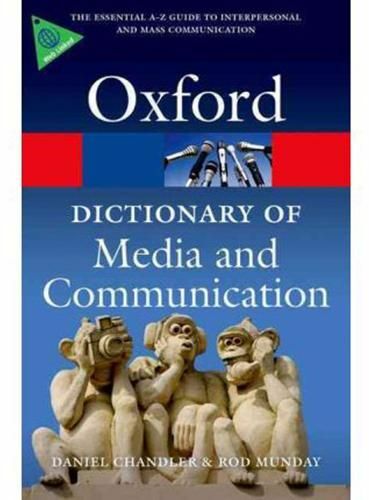 The Dictionary of Media and Communication is an authoritative and wide-ranging A-Z providing over 2,200 entries on terms used in media and communication, from concepts and theories to technical terms, across subject areas that include advertising, digital culture, journalism, new media, radio studies, and telecommunications. It also covers relevant terminology from related disciplines such as literary theory, semiotics, cultural studies, and philosophy. The entries are extensively cross referenced, allowing the reader to link related concepts that span different discourses with ease. It is an indispensable guide for undergraduate students on degree courses in media or communication studies, and also for those taking related subjects such as film studies, visual culture, and cultural studies. With highly relevant web links to key essays, images, examples, and websites which complement the A-Z entries, all updated and accessed via a companion webpage, as well as a biographical appendix with web links to key people, this is a valuable resource for media professionals, postgraduates, academics, and researchers and an eminently practical and user-friendly reference for anyone involved in the worlds of media and communication.